Today is a big day for me! 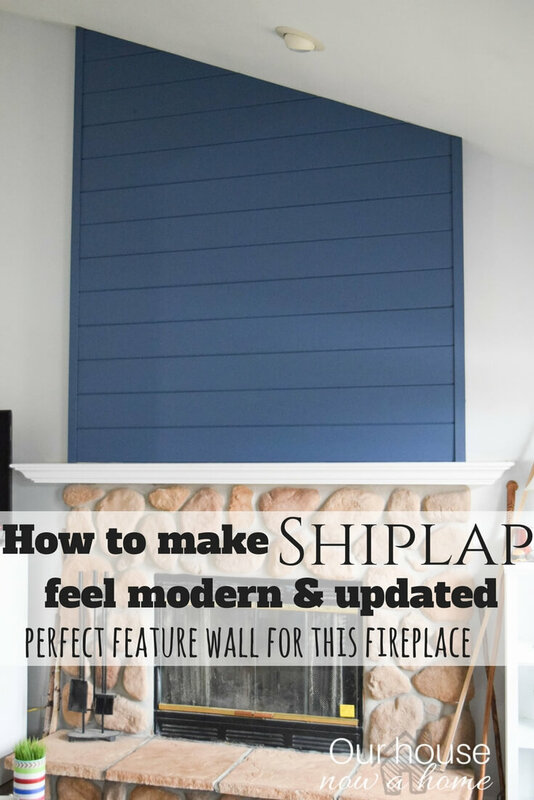 A big day for this blog, and for my home decorating self. A few months ago I was offered an amazing opportunity. 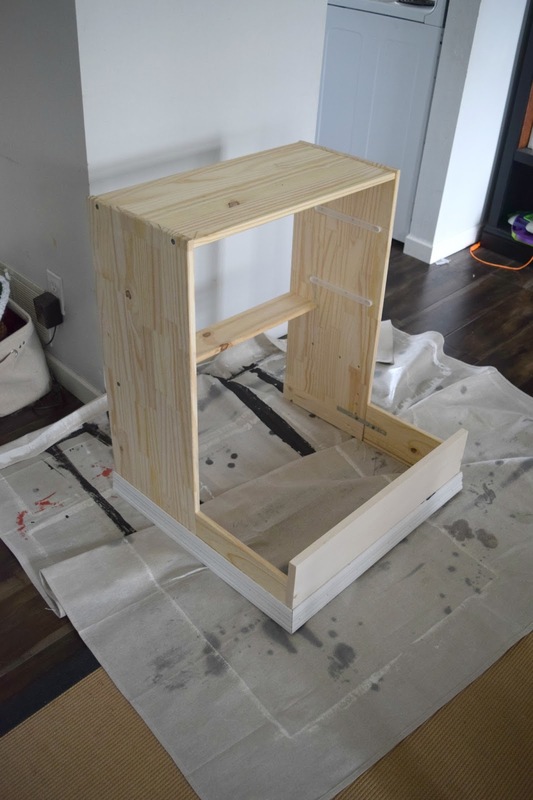 I was asked to take part in the IKEA hack challenge. I have enjoyed seeing the past ones, voted for my favorites and enjoyed seeing what multiple people each did with the same piece of furniture. 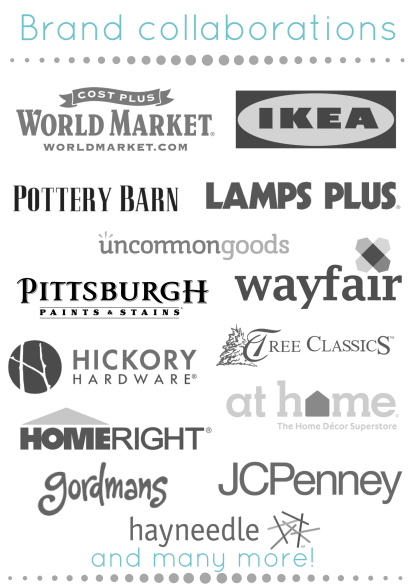 The fact that I was getting to work with these brands and take part in this challenge was a big home decorating bucket list item for me. Check! 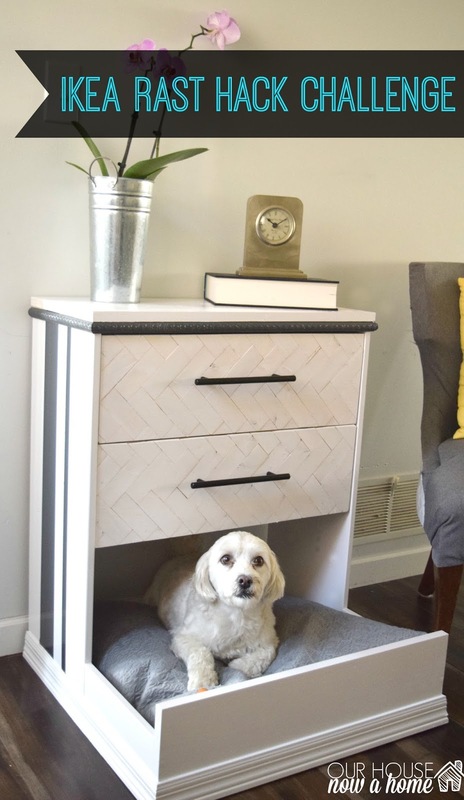 My project is IKEA Rast dresser hack- dresser into dog bed because I am one of those people that are obsessed with their dogs! 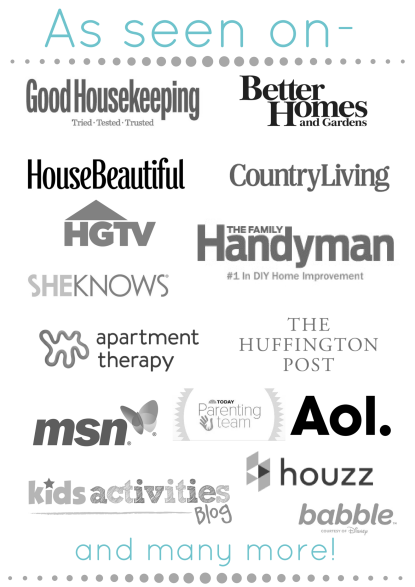 I am just starting to work with brands, and have had some amazing experiences. This is one of them. I was sent the Rast dresser from Ikea. It was a wonderful blank slate. I also get to work with Pittsburgh paints with their new Trim, door and furniture paint. This is a high gloss, high coverage paint. I was eager to give it a try. I also get to use the wonderful Hickory Hardware for this. I am very familiar with this brand, I have used it in my kitchen and bathrooms. The rules were open, use these great brands and turn this dresser into something fun, creative, and unique. I began this challenge by staring at the dresser, hoping inspiration would strike. I stared down at my sweet and tiny dog Teddy when it did strike. We have two dogs, the little Teddy and big dog Finn. Each has their own beds. Two dog beds in the house can take up a lot of space. 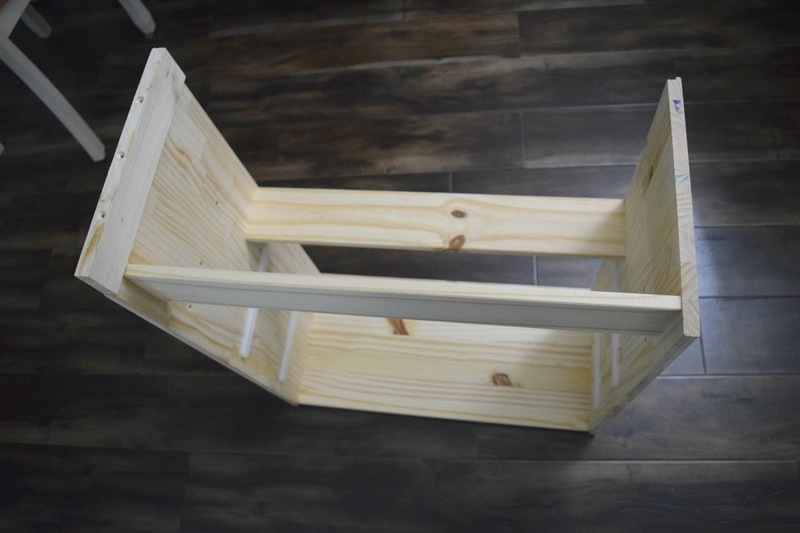 What if I put Teddy’s bed in something functional…. light bulb! I was still a little unclear on my complete plan but assumed I would figure it out as I went along. First things first, I knew that the bottom drawer was going to be coming out permanently. I also knew that the dresser itself needed to be raised slightly. Teddy is a small Havenese dog, but not small enough to squish under this dresser without it being raised. I removed the front piece of the dresser as well. This will allow the dog bed to go in the bottom. 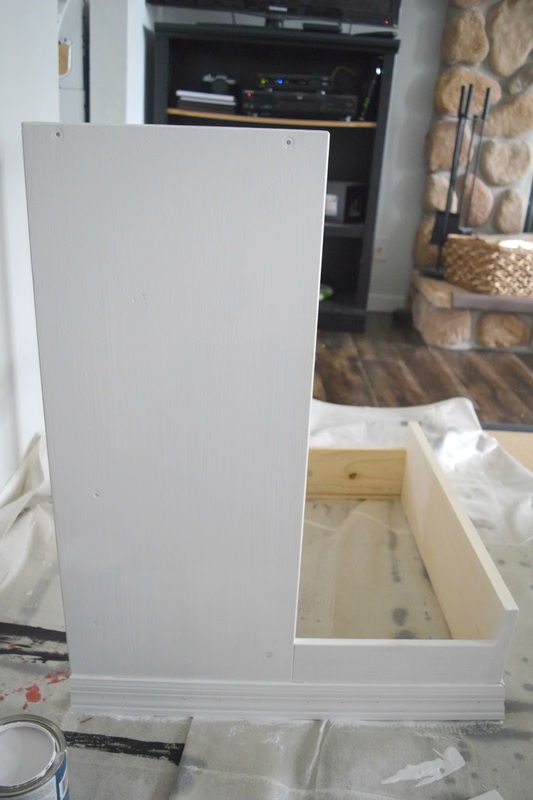 This dresser is sitting upside down, the additional boards are being added to the bottom. I just set it this way to show the new additions easier. 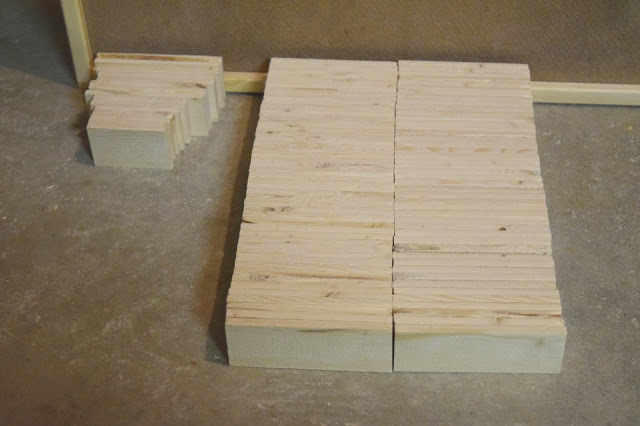 I cut three boards the same width as the dresser to go on the sides and back. 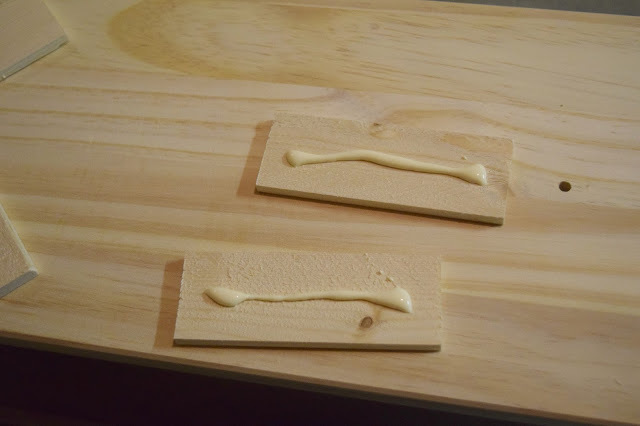 Drilling holes into them, to then drill in screws into the new boards and attaching to the bottom of the dresser. 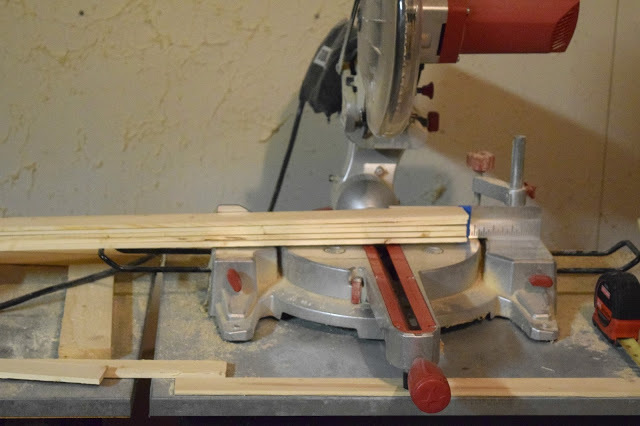 This needed to be done because the dresser base was thin, screwing directly into it would have split the wood. 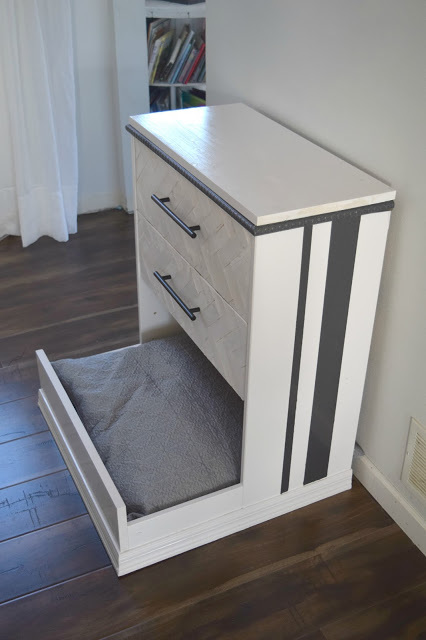 I took apart the bottom drawer and used the pieces as the dog bed frame. 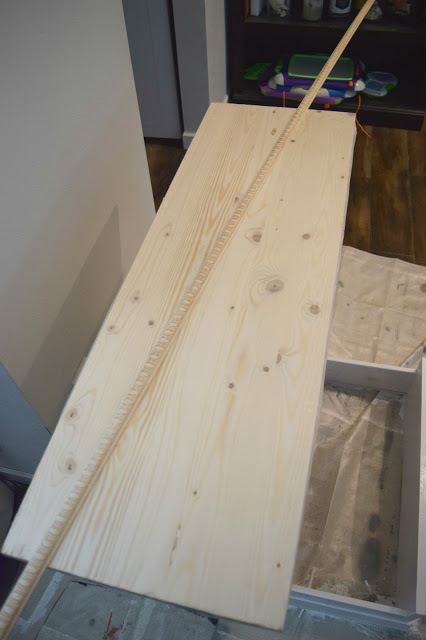 Putting the drawer sides up against the front of the dresser. 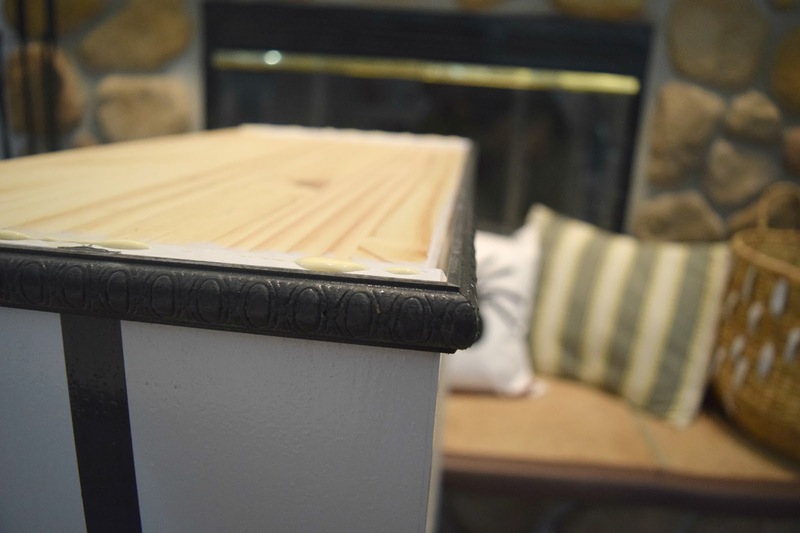 Using brackets and securing the new dog bed frame to the existing dresser base. Needing to make this have a few visually pleasing aspects to it was on my plan of attack. I mean, I have seen these IKEA hacks before. The amount of pretty and stunning is crazy. I wanted to make something subtle but fun to the drawer fronts. 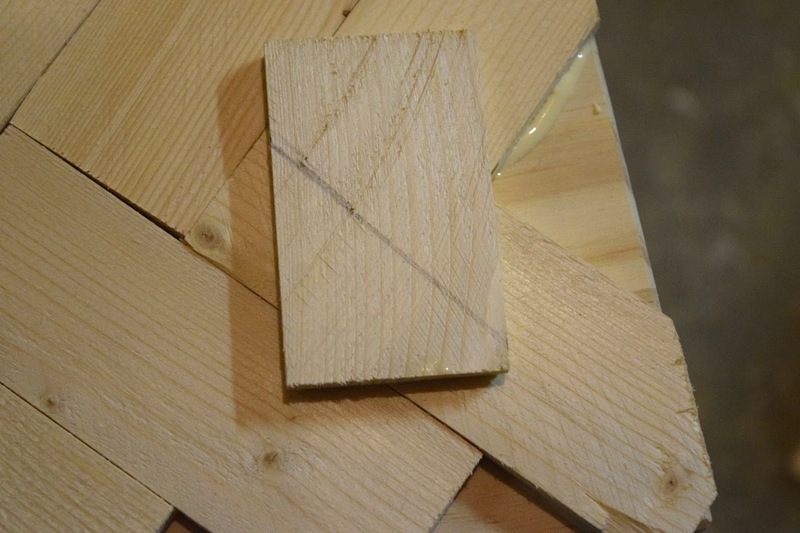 I have a bunch of thin scrap pieces of wood. I cut them to be about 4 inches long. Not knowing how many would be needed I got a little cut happy. Putting a line of wood glue on the backs of the small wood pieces. I set the pattern in a herringbone design. This is my absolute favorite pattern to do with wood right now. I am not sure why, but I adore it. 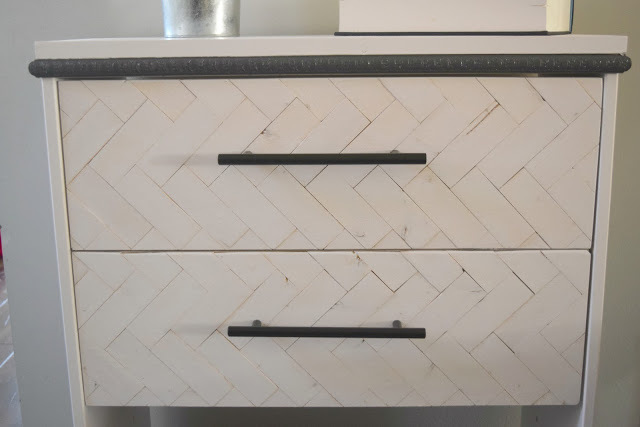 I just cannot quit you herringbone! 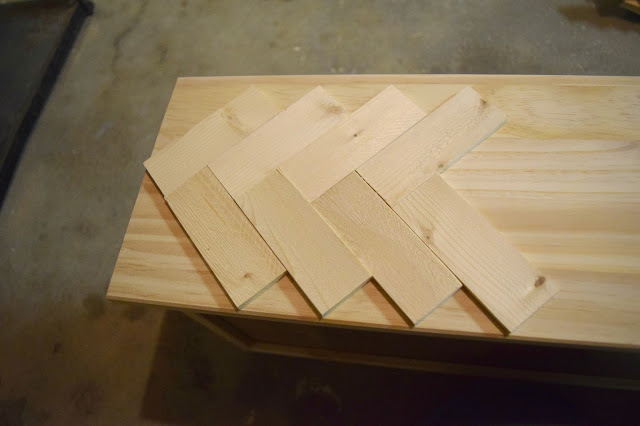 I lined the pieces up along the center of the drawer front. With the edge pieces it was a little trickier. I set small pieces up against the edge and marked where the extra cuts needed to be. 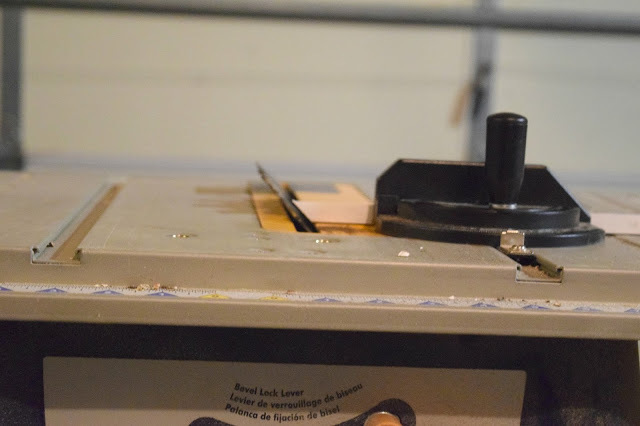 This allowed the pattern to be flush to the edge of the drawer front. Be sure to let the wood glue sit overnight. While I was letting that dry I went inside to add some more details to the dresser. With me having added a piece to the bottom of the dresser, I needed to make all of that look cohesive. 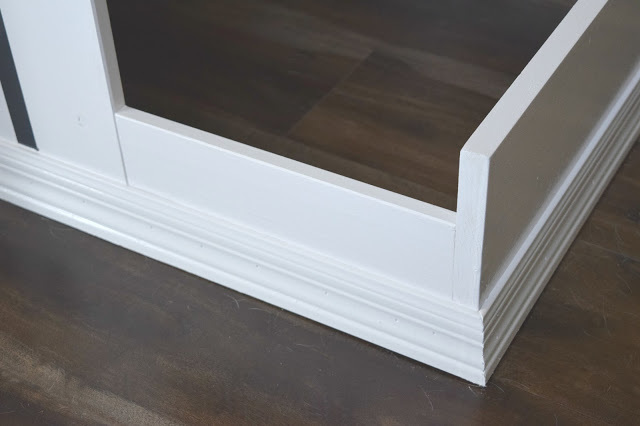 I purchased primed floor board trim. Using a table saw and cutting them at a 45 degree angle. This will make the corners be neat and flush. 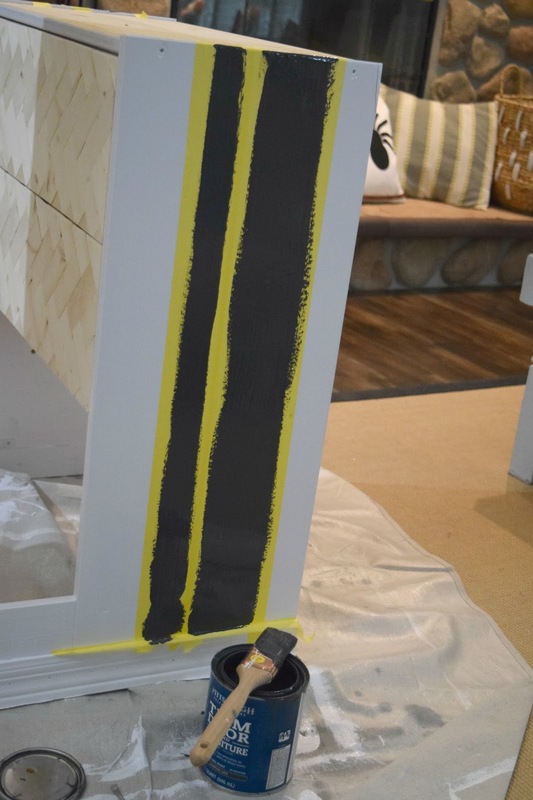 The trim gives this dresser a finished look. Making the new dog bed appear to be part of the dresser itself. 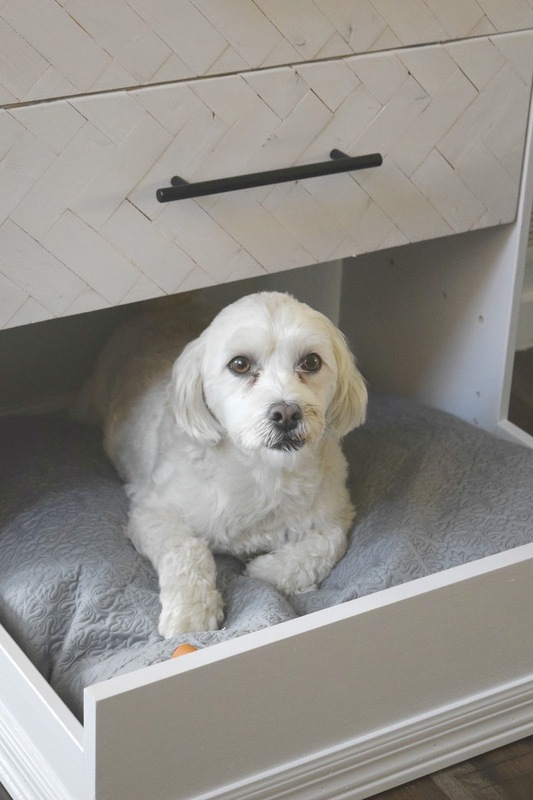 I used the original third drawer for the front of the dog bed. Nailing it into the side boards. I selected the bright white for this dresser. 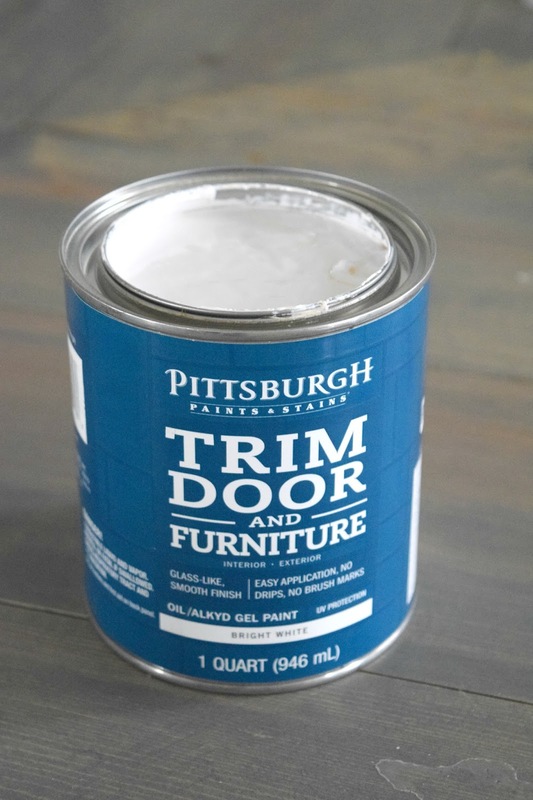 The trim, door and furniture paint is a thick paint. Do not shake it like you would other paints. It is very thick and will need to be stirred a lot. It will appear clumpy until it has been stirred enough. Do not add water to thin it out, just keep stirring. It is fun to chant “just keep stirring” in a sing song voice like Dory from Finding Nemo does. You know the song, sing it! When the consistency is similar to how most paints are you know it is mixed enough. 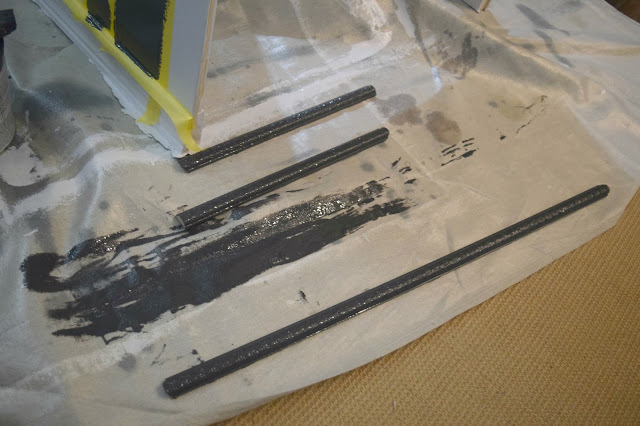 This is a oil based paint, so clean up can be pretty impossible. Be careful painting. This paint needs much less to cover a surface. I had 1 quart cans in both colors and have well over half still left. I would say almost the whole can is left. I will be able to use this particular quart of paint for a while. That my friends is a good thing, this paint is worth every penny. The paint does come on thick. The amazing thing about this paint is that it drys streak free. It really does. It has the appearance of a sprayer, but done with a paint brush. This brand is also high gloss which makes this dresser and Teddy’s new bed feel very fancy. I did one coat, and be sure to let it dry before coat two goes on. The drying time is a little longer then other paints I have used. I left it to dry overnight. I am not done adding things to this dresser. I really wanted to make it shine. I purchased a wood piece to fit as a top to the dresser. The Rast dresser had a top but the edges came up above the original top. I wanted a flush top. I also purchased a trim piece with small circular details. This will go under the top of the dresser. To cover the small space in between the new top and the dresser. Also to give just a little more something to this. 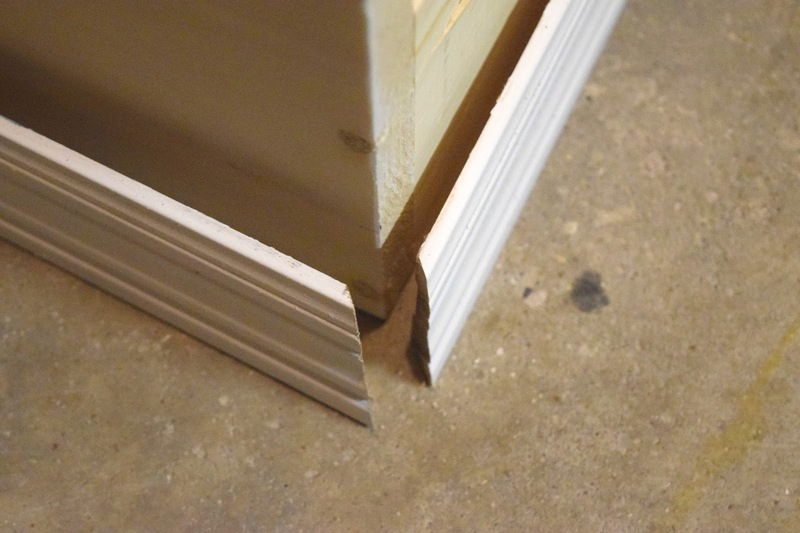 I cut the corners of this trim piece at a 45 degree angle as well. I prefer to do most corners this way, especially with furniture. It makes the furniture piece appear polished and done. With all of this shiny white going on with the dresser, I felt something needed to ground it. I selected the Charcoal gray as a accent color for this dresser. I painted the trim pieces that color. 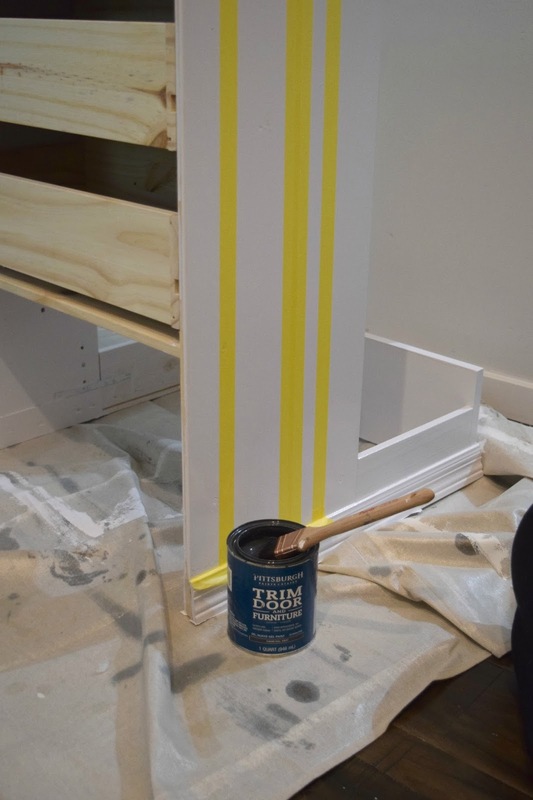 This paint is a very thick one, and the detail of the trim did get lost a little with the paint. 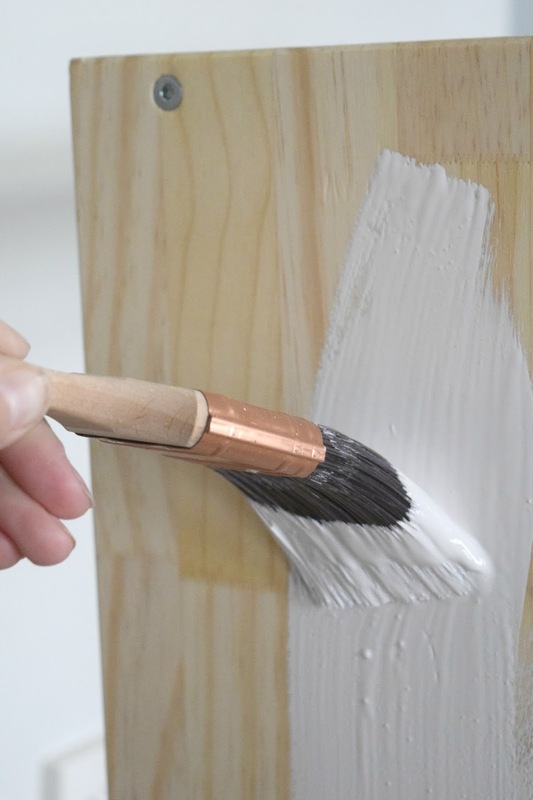 If you are painting something with a lot of detail and using this paint, doing lighter coats, with smaller amounts of paint is a good way to still be able to see the details. I did this for the front of the drawers. 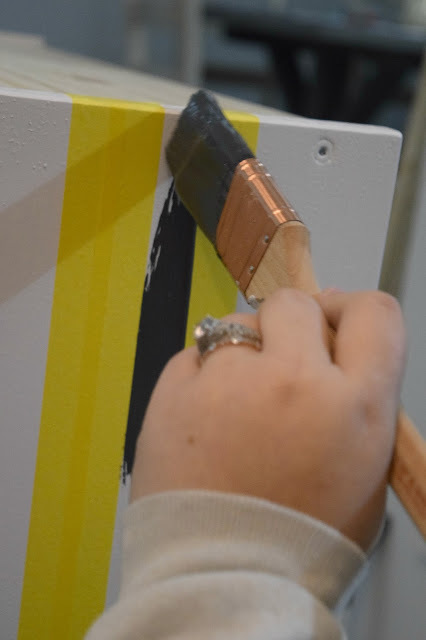 Allowing the herringbone design to not get lost in the paint. It worked perfectly that way. My intitial plan was to use a stencil and add a fun pattern to the side of the dresser. Once the herringbone design was there and I saw how dark the gray paint was. I worried it would be too much going on. However, I knew that I still needed to dress up the sides. So I felt that some well placed vertical lines would be just what this needed. I taped up the sides. 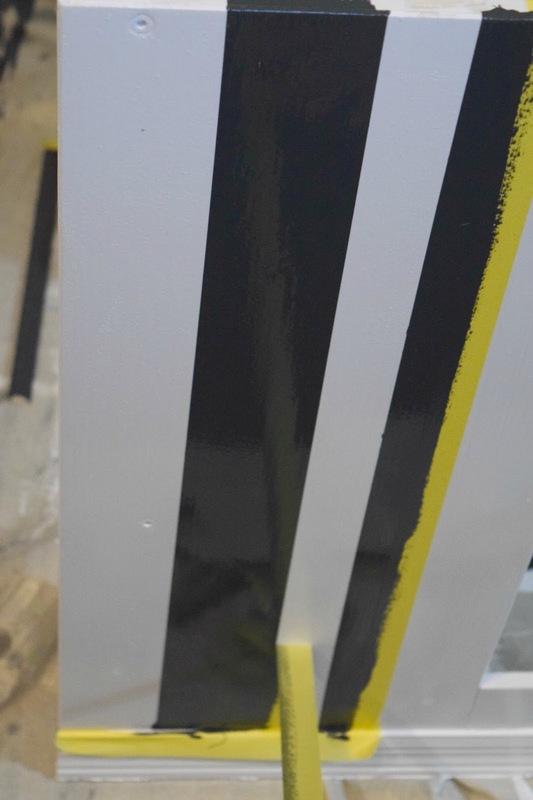 Having one large stripe and one smaller stripe on each side. Once I knew the painters tape was pushed down, completely flush to the dresser. This will allow no seeping of paint. I painted the gray into the lines. I only needed to do one coat of this. This color is such a dark and rich color. I can see this being a big time color people will use for furniture! Waiting overnight, I was able to pull off the painters tape. 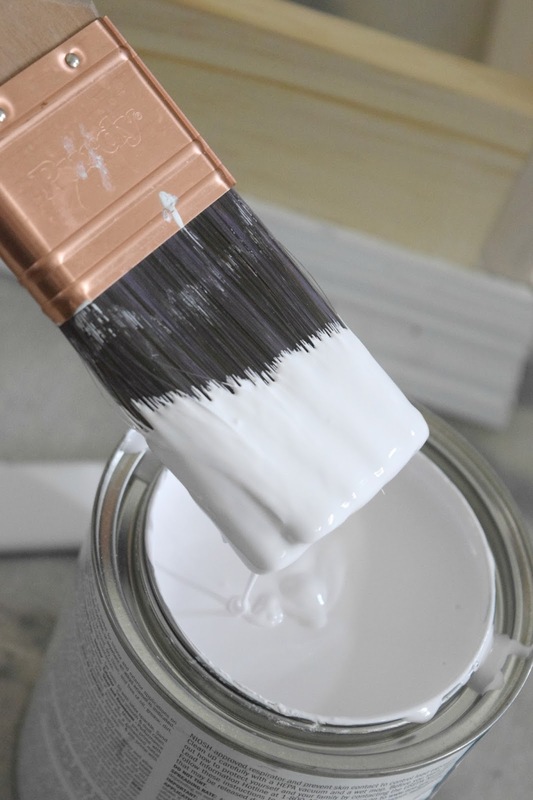 Can you see the beautiful sheen on that paint?!! With the dresser painted I just had to add a few more small details. I used wood glue to put the trim and the top onto the dresser. I selected these great metropolis pulls from Hickory Hardware. They are matte black and are 8 inches long. They are sleek but big. I felt that the larger handles would work beautifully with this. 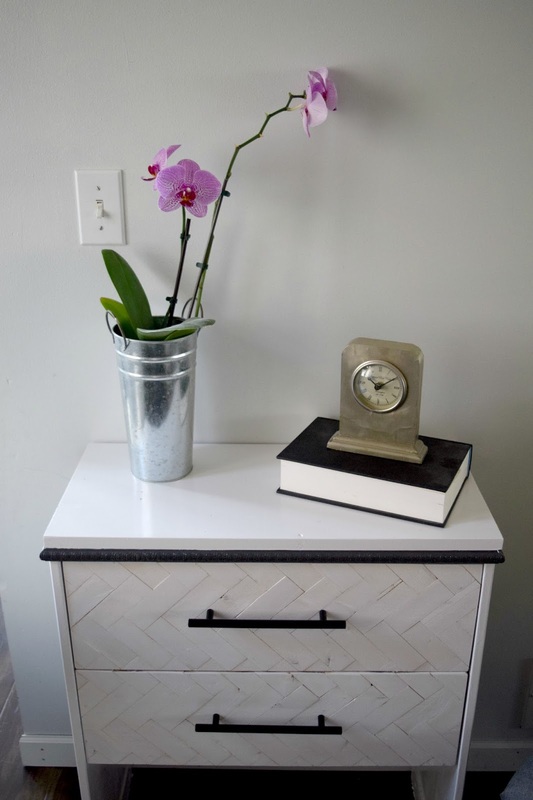 This dresser turned into a modern look with the black and white. These drawer pulls fit right in. They screw into the back of the drawer, inside. I marked where I wanted them to go and then drilled a hole into the drawer front through to the interior. 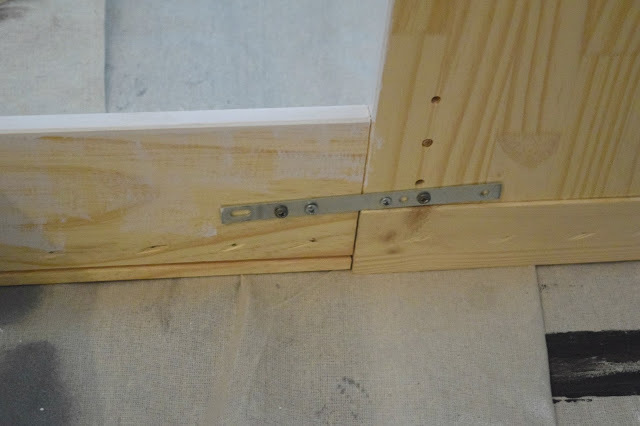 Then using the hardware provided from Hickory hardware to connect the pull to the drawer. I added a super plush and cushy pillow to this. This is a luxurious and pretty bed for Teddy. Can we say spoiled? I am now one of those people that has furniture just for their dog. All I need is my tiny purse for my tiny side kick to go everywhere with me. Teddy was eager to claim his throne and pose for his adoring fans. With this being all about Teddy (and Finn) I made this a complete dog center. We have leashes, treats and sweaters. What? I am not a crazy dog lady who dresses them up in cute outfits, it is sweater weather for dogs too. In my defense it gets cold here in Wisconsin, they need some warmth. Also a dog in a sweater is the cutest thing ever, don’t judge me! The trim choice for this was spot on. Too much detail and it would have taken away from the herringbone design and the stripes. I also like that it makes this piece look cohesive with the bed and the dresser meshing well. This is such a contemporary piece. A little outside my normal. Truth be told, my first reaction was to stain a portion of this with a dark wood stain. However, keeping the color scheme simple with white and pops of charcoal gray is so fun and different. It also lets me play up accessories to set on top of this. Teddy was not wanting to move from this spot, and anytime someone walks by he gives a little growl. He likes his new home very much. I did the thinner coat of paint here on the drawer fronts. 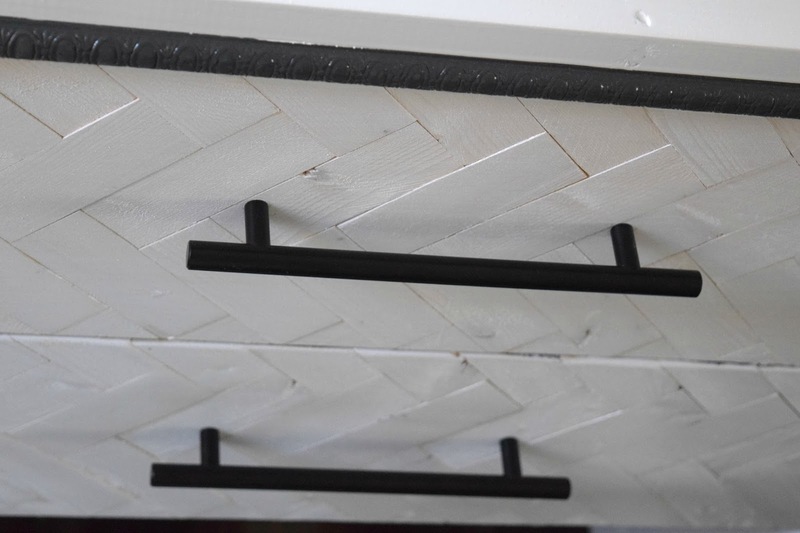 I did not want to loose the herringbone design with the thicker paint. I have one dresser and two dogs… we are going to need a bigger dresser! Finn is feeling a little left out. The poor guy will just have to suffice with overtaking the complete couch, like usual. Just to remind you of the complete transformation, it is pretty big! I love that this plan came together as the project went along. It can be hard to flesh out a complete plan. Things change, inspiration strikes, and adjustments need to be made. I ended up with a useful piece and a space saver. Now we have one doggy bed hidden away. Teddy also has a little spot to claim as his. 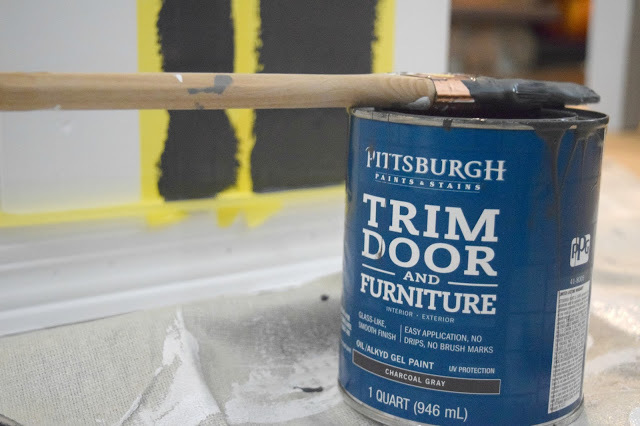 I do need to give a big shout out and thank you to IKEA, Pittsburgh paints, and Hickory Hardware. They supplied everything I used in this and allowed Teddy’s modern doggy bed dreams come true. Also my dreams as a home decor blogger to come true. It was a fun and creative collaboration. Now, to the important stuff. I need you all to head over and vote for the best IKEA Rast hack. Here is the link! There will be mine and a group of others. You can vote for which one you think is best, share, tweet and get the word out. I am so eager to see what the other bloggers came up with. 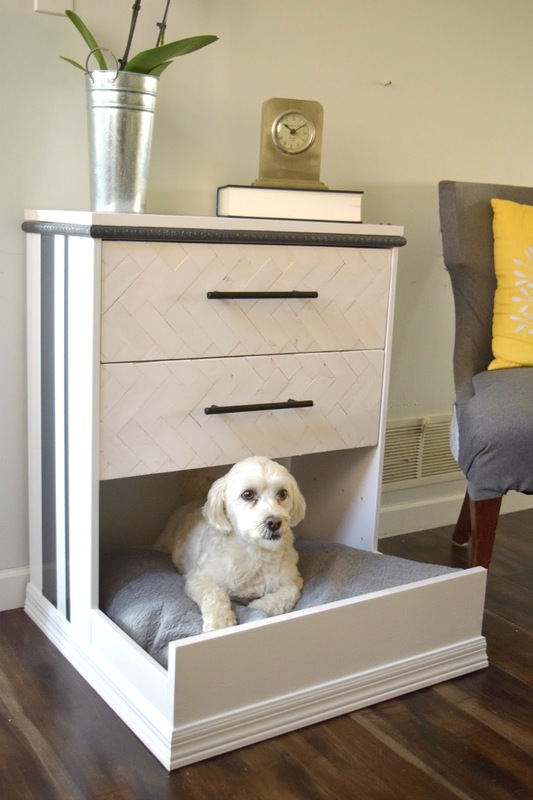 Cute dog bed! Looks like a fun project, too. That herringbone detail is to die for! Thank you! I think that is my favorite part of the dresser as well. wow! Super impressed! 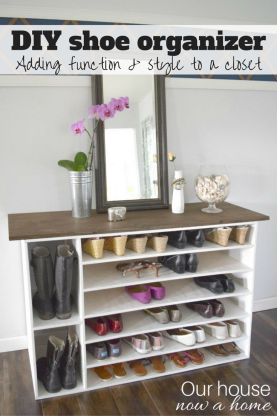 I am not good at DIY stuff, so this is awesome! Wow! Super cute! I just spent the better part of the last 2 weeks putting together IKEA stuff. I love the dog bed hack! Ha ha, those directions can be crazy confusing! Wow now this is AMAZING! 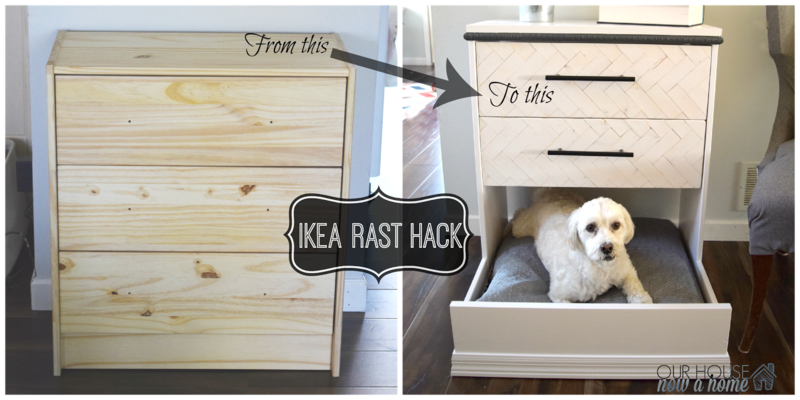 I think this is one of the best Ikea DIY tutorials I've ever seen! How many hours in total do you think this would take? Wow, thank you so much! I think total this took maybe 4 hours of actual work. Not counting time for paint to try and glue to set. It looks so great! I LOVE the drawer fronts! Thank you so much! It was fun to work with a blank beginning. Emily, this is so cool!! I love it! You did awesome and it's so unique. Pinning! This is the coolest dog bed I've ever seen! I don't even have a dog and I want this. Very cool, Emily! I love how it turned out. I don't know how you ever came up with the idea, but it's a winner, and I love the final look! Thank you so much! 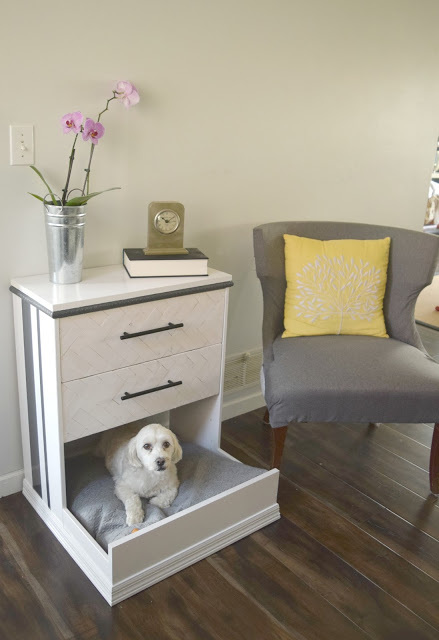 I knew I needed to come up with something creative, and having a place for my little dog helped too. Emily what a great idea! I especially love the herringbone design on the drawers! Awesome Emily! Love it and love it's for our paw members! What a cute pet bed. You did a fantastic job. Sharing and voting. This is fantastic! You are so talented This is such a great piece, it's great when you can switch up standard furniture! Wow! What an unbelievable transformation. 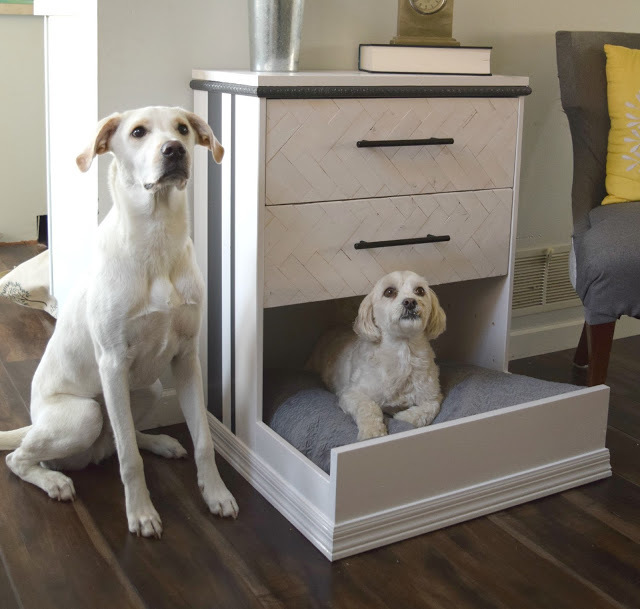 I have 2 dogs as well and their dog beds do take up a lot of room so I love the idea. Not sure I could pull something like this off, but you've got me thinking. It is crazy how dog stuff takes over the home. Baby stuff is the same way, but the kids eventually outgrow all that. It is nice to have one of the beds tucked away. Looks great and so creative .Headed to vote for you now. 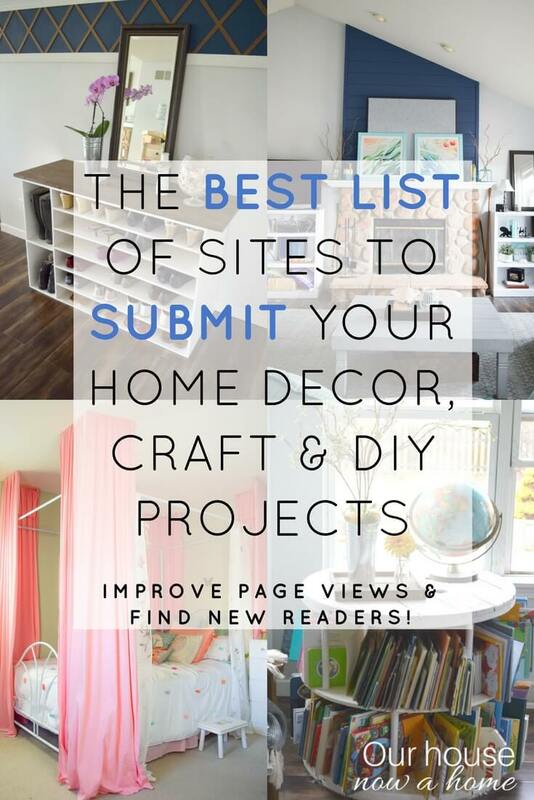 Obviously, the ultimate DIY-er. The big dog looks sad though. He is sad, he wants a special bed too. I do not think there is a dresser big enough for him. He does have his own bed, but I think he was feeling left out. I love everything you do already and I just voted. Hope you win! This is such a great idea!! 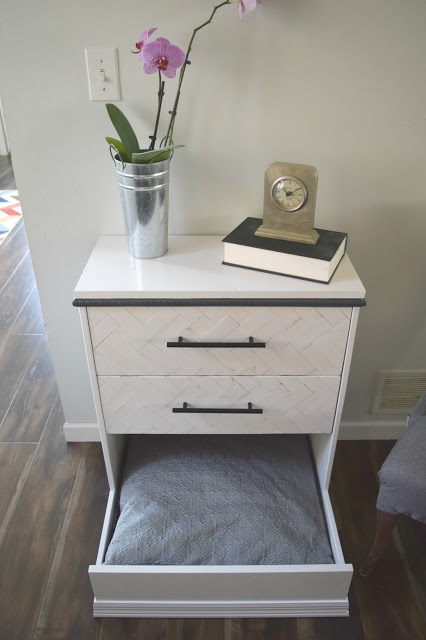 I LOVE the herringbone pattern on the drawers. Awesome job on this one! This is just beyond adorable. I love how the little guy has his own space, but the big guy is left out. Now you will have to correct that situation. The piece is so beautiful. And the herringbone takes it to the next level. Thank you! My big dog Finn has his own bed, I think he wants a special little cozy spot too. I will have to find a bigger dresser. What an amazing hack! And with so many beautiful details! Great! Pinning! This is seriously one of the best hacks I've seen. I love how you show every detail of how you made it. 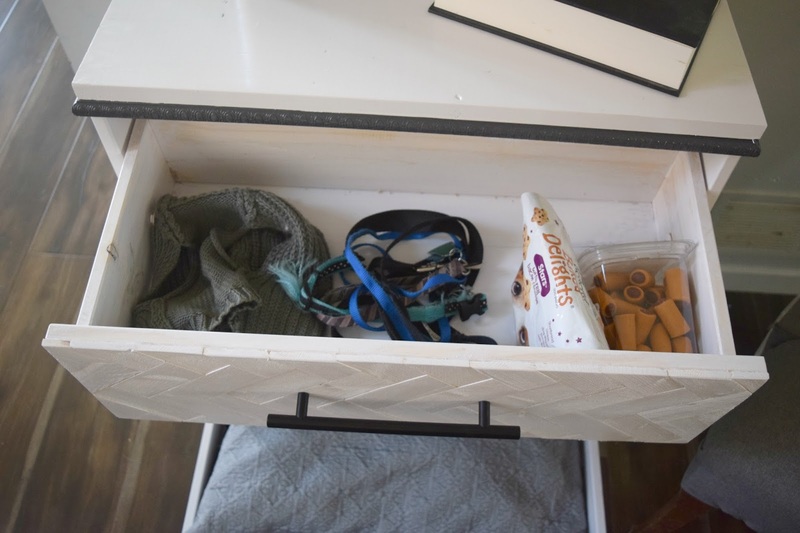 The drawers are my favorite and your little Teddy is adorable! Good luck in the competition. This is so cool! 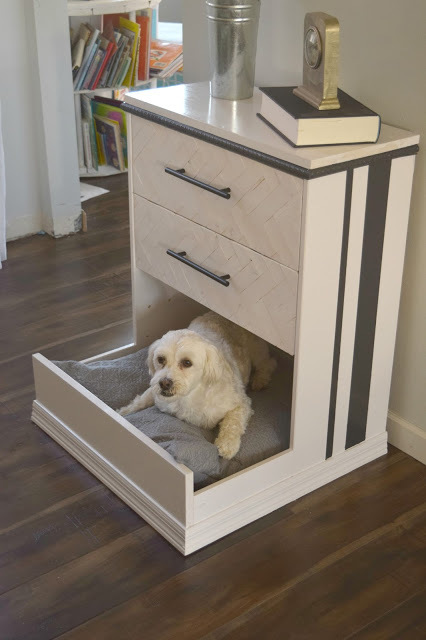 I don't have dogs, but his is such a great idea! What an awesome project! Congratulations and great work! That is so cool and what a transformation, definitely can tell he is a happy puppy now. I have voted (ps its you ;)) and I wish you all the luck! Thank you so much for the support! It was a lot of fun to do! Really cool idea!! Makes me want to try this out… but my dog won't lay in that. He's much too spoiled and will want either on my feet or in my lap. Love this! We love dogs (we have 4) and this would be so cute! 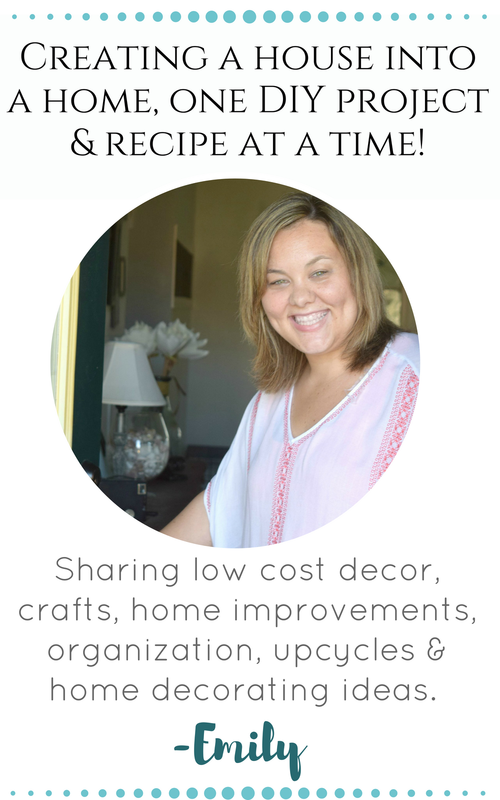 I am co-hosting over at Merry Monday and you are my pick for a feature! Hope you have a great week! Oh my goodness! This is so adorable and those dogs are too much. Your Teddy sounds a lot like our Daisy…little white dogs with big attitudes. I'd love it if you link this project up with us at Best of the Weekend. The party went live Friday night and is open until Wednesday evening. 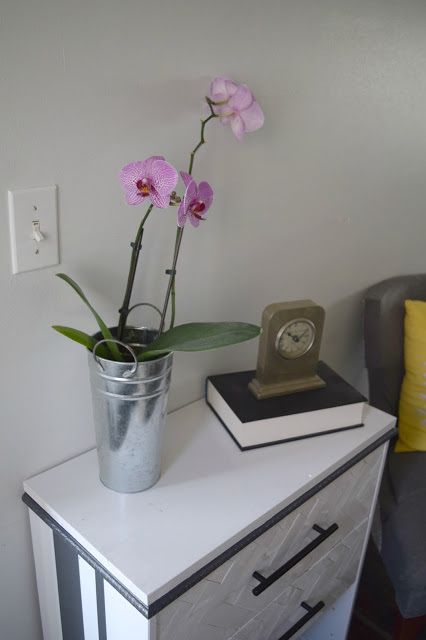 This is an incredible makeover! Thank you so much for the invite, I will head over there! Brilliant and executed so well! LUV the herringbone so much I would have put it on the bottom front of the dog bed as well. Thank U for this amazing idea, its definitely a Winner!